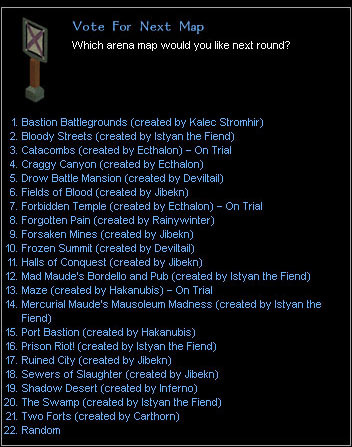 Please join the BoW guild at forum.bastionsofwar.com under BioWare's Guilds and Registry. 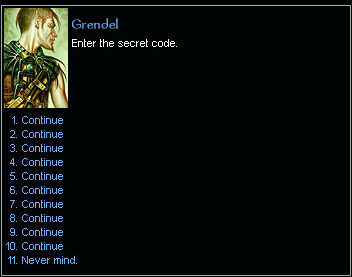 Once your guild application is approved, get the secret code and give it to Shady Character in the entrance, so your characters may receive their guild ring. Please visit the server status page for a real-time update of the BoW servers and how to report a server crash. Please report character problems on the character problem forum topic or email Lord Alexander. Make sure you include your player account name and character name! Duplicate Character Names: You should never reuse the exact same character name. If you do, you will only be able to see the oldest one created. To retrieve the original character, use Shady Character to mark the duplicate for deletion. When it's removed within 24 hours, your old character with the same name will appear. Character Deletion Requests: You must use Shady Character to mark characters for deletion and then wait up to 24 hours for them to be removed. If you have an invalid character that you can't login, post or email a request to delete that one specific invalid character. Player accounts unused for longer than six months are periodically removed from the server. To have characters restored, please post to the archived character forum topic or email Lord Alexander. Make sure you include your player account name! As always, please report bugs and exploits in the guild forum. However, if the exploit is particularly bad and/or can be abused by others, please email or IM [DM] Rainywinter. We're especially interested in hearing about exploits that allow players to break the server rules (as opposed to the numerous NWN bugs). Those who report such exploits will be rewarded. Custom appearances are given to DMs, prominent members of the BoW community, and contest winners. It's only a cosmetic change -- they don't have an advantage and must build and level up their characters just like everyone else -- but it's our way of recognizing those who've helped the server or guild. The custom skin must be humanoid (two arms and two legs), and the size must match the base character (Halflings and Gnomes are small, all other player races are medium). Those who receive custom appearances may also customize their name, portrait, voiceset, description, wings, and tail. Please note that no custom skin will show the armor and helm you're wearing. Some will show a shield and a few more will show a weapon -- but some won't show either. Requests must include all the above fields. If you don't want to change something (for example, you already have the correct portrait), simply enter "Unchanged." If you're requesting an Appearance # that someone is already using, you must get permission from them to share. Alternatively, instead of a creature or NPC custom appearance, you may add wings and/or a tail to your character. Players are responsible to preview their choices. Do not request something unless you're absolutely certain it is correct. 4. Export the completed area, and e-mail the ERF file to [DM] Aggaron Wraithstouch at maps@bastionsofwar.com. Include your player account name. Please visit the NWCon page for information on this periodic online NWN convention and past BoW tournament results. Please visit the Call of War page for information on this periodic Bastions of War tournament. Entire Contents Copyright � 2003 - 2008 Alexander E. Usticke. All rights reserved.